Oahu saw a 12.6 percent spike in robberies last year and a 5.9 percent increase in overall violent crime, according to FBI crime statistics released yesterday. There were major decreases in property crimes, including 12 percent fewer burglaries, 9.9 percent fewer larceny/thefts and a 7.5 percent decline in vehicle thefts. Honolulu was in step with a nationwide trend of increased violent crimes and decreases in property crimes, according to preliminary figures in the FBI Uniform Crime Report, compiled with statistics from nearly 12,000 municipal and state law enforcement agencies. Robberies occurred at a rate of more than two each day in 2006 as overall violent crime on Oahu increased by 5.9 percent, according to FBI crime statistics released yesterday. Property crimes decreased in all categories, a trend for which the Honolulu Police Department credits community participation in reporting crimes and identifying culprits. The Honolulu statistics mirror trends in large cities across the country, but local figures exceeded the national norm. Nationwide, violent crime was up 1.3 percent. 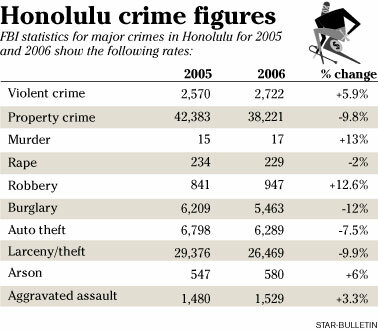 Oahu property crimes decreased by 9.8 percent while the nationwide decline was 2.9 percent. There were 947 robberies on Oahu, a 12.6 percent spike that police say was partially attributable to a spate of 41 bank holdups last year. Detectives closed 36 of those cases, said spokeswoman Michelle Yu. By comparison, there have been three bank robberies so far this year. Nationally, robberies increased by 6 percent, the highest increase in any category. There were 229 rapes reported in 2006, 2.1 percent fewer than 2005, which saw an increase of 5.4 percent. Oahu had 17 murders last year, compared to 15 the previous year and 26 in 2004. It counted as a 13.3 percent increase. Reported assaults numbered 1,529, up 3.3 percent. There were 580 cases of arson, up 6 percent over the previous year and continuing the trend that saw a 28 percent increase in 2005. The FBI doesn't count arson as a property crime. » There were 5,463 burglaries, a 12 percent decrease that followed a 14.2 percent decrease in 2005. » Larceny/thefts numbered 26,469, a decline of 9.9 percent from 2005. » The 6,289 vehicle thefts were 7.5 percent fewer than the previous year, about the same as the decrease in 2005. "The decrease in property crimes is due to partnerships between community groups, businesses and law enforcement," Yu said. "We credit the community for reporting criminal activity and being willing to come forward to work with the police and prosecutor." The FBI's Uniform Crime Report is prepared from information provided by nearly 12,000 state and municipal law enforcement agencies. The new numbers come in the wake of the Bush administration's shifting focus -- evidenced by lessening Justice Department grants and FBI investigators -- from fighting crime to combating terrorists after the 2001 attacks. Attorney General Alberto Gonzales has pledged to devote millions of additional dollars and a surge of federal agents to aid crime-riddled cities. Indianapolis Mayor Bart Peterson, a Democrat who presides over the National League of Cities, said local officials nationwide are asking Congress for more than $1 billion annually to restore stretched-thin police departments back to their full force. He attributed the rise, in part, to increased gang activity, violent youths and domestic crimes. Indianapolis' murder rate rose by 30 percent, to 140 homicides in 2006 from 108 in 2005, the data show.